How to Cite This Chapter: O’Byrne PM, Niżankowska-Mogilnicka E, Bochenek G, Gajewski P, Mejza F. Asthma. McMaster Textbook of Internal Medicine. Kraków: Medycyna Praktyczna. https://empendium.com/mcmtextbook/chapter/B31.II.3.7 Accessed April 19, 2019. Chung KF, Wenzel SE, Brozek JL, et al: International ERS/ATS guidelines on definition, evaluation and treatment of severe asthma. Eur Respir J. 2014 Feb;43(2):343-73. doi: 10.1183/09031936.00202013. Epub 2013 Dec 12. According to the 2016 Global Initiative for Asthma (GINA), asthma is “a heterogeneous disease, usually characterized by chronic airway inflammation. It is defined by the history of respiratory symptoms such as wheeze, shortness of breath, chest tightness, and cough that vary over time and in intensity, together with variable airflow limitation.” Chronic inflammation is associated with airway hyperresponsiveness and recurrent symptoms that are often worse at night or early in the morning. Variable airflow limitation is caused by bronchial smooth muscle contraction, mucosal edema, and formation of “mucus plugs.” In some patients irreversible airflow limitation may be caused by airway remodeling. There are a number of different asthma phenotypes, the most common of which is allergic asthma. In such cases the binding of an allergen to which the patient is sensitized to specific IgE antibodies on the surface of mast cells leads to the release of mediators (including histamine, cysteinyl leukotrienes, and proteolytic enzymes), which cause airway obstruction. In some patients this early phase of allergic reaction is followed within 6 to 8 hours by a late-phase reaction in which mast cells, basophils, and other cells release cytokines and chemokines. This causes an increase in the influx of inflammatory cells—particularly eosinophils—to the airways. The mechanisms of nonallergic asthma are not as well understood, but its histology is similar to that of allergic asthma. Repeated episodes of airway inflammation are believed to result in airway remodeling. Factors triggering asthma symptoms and exacerbations or prolonging their course: Allergens, respiratory infections (predominantly of viral etiology), air pollutants (including tobacco smoke, household aerosols, paint fumes), exercise, stress, weather conditions, drugs (beta-blockers, nonsteroidal anti-inflammatory drugs [NSAIDs]), food additives. Factors increasing the risk of exacerbations: Uncontrolled asthma, excessive beta2-mimetics use (>1 canister of 200 doses per month), lack of inhaled corticosteroid (ICS) treatment, forced expiratory volume in 1 second (FEV1) <60% of the predicted value, major psychological or socioeconomic problems, exposure to tobacco smoke, exposure to allergens (in allergic asthma), comorbidities, increased sputum or blood eosinophilia, pregnancy, intubation or treatment in an intensive care unit (ICU) due to asthma, ≥1 severe exacerbations in the previous 12 months. Factors increasing the risk of fixed airflow limitation: Lack of ICS treatment, exposure to tobacco smoke or noxious inhaled agents, low FEV1, chronic cough with sputum production. 1. Symptoms are variable in nature and consist of breathlessness, chest tightness, wheezing, and cough. They resolve spontaneously or after treatment. Cough can be the sole symptom. In some patients symptoms of other allergic diseases, most frequently allergic rhinitis, may coexist. 2. Signs: Wheezing and rhonchi (diffuse, bilateral, mainly expiratory) and a prolonged expiratory phase. These are sometimes observed only during forced expiration and may be absent in very severe exacerbations (silent chest). 3. Natural history: Asthma may occur at any age, but it most commonly develops in childhood; in such cases it is usually allergic. Asthma with the onset in adulthood is more frequently nonallergic and often has a more severe course. Asthma exacerbations are severe, potentially life-threatening events, which usually develop over several days. Signs and symptoms of asthma may be absent in the periods between attacks or exacerbations. 1. Spirometry: Airflow obstruction measured by FEV1 (however normal spirometry results do not exclude the diagnosis of asthma); positive reversibility test: improvement in FEV1 >12% and >200 mL after an inhaled bronchodilator; positive bronchial challenge (methacholine or histamine; sometimes indirect airway challenges such as exercise). 2. Peak expiratory flow (PEF): Mean diurnal PEF variability >10% (diurnal PEFmax - PEFmin/PEFmean, averaged for 1 week) identifies asthma. Short-term PEF monitoring is used for assessing response to treatment, identifying factors triggering asthma attacks (eg, occupational factors), and establishing a baseline for action plans. Long-term monitoring is used in severe asthma or in patients with poor perception of symptoms. 3. Chest radiographs are usually normal. In patients with asthma exacerbation, radiographs may reveal features of hyperinflation and certain complications of asthma exacerbations (eg, pneumothorax). 4. Pulse oximetry and—in acute severe exacerbations—arterial blood gas measurements may be performed to evaluate the severity of respiratory failure during exacerbations and to monitor their course. Notably, alveolar hyperventilation is usual in an acute severe exacerbation, so normal arterial partial pressure of carbon dioxide (arterial pCO2) may be a sign of impending respiratory failure. Venous blood gases may also allow evaluation and follow-up of pH and pCO2. 5. IgE-dependent allergic tests: Skin prick tests as well as total and specific serum IgE levels may identify allergens causing sensitization in patients with allergic asthma. 6. Measurement of exhaled nitric oxide (FeNO) levels is not recommended for the diagnosis of asthma but may prove helpful for disease monitoring in assessing adherence to ICSs. 7. Sputum examination: Sputum eosinophilia is a marker of eosinophil inflammation in the airways and can be useful in guiding management. None of asthma symptoms are specific. The diagnosis, based on medical history and symptoms, must include demonstration of expiratory airflow limitation and its excessive variability (Table 1). a) Daytime symptoms not more often than twice a week. c) Reliever medications needed not more often than twice a week. d) No activity limitation due to asthma. 2) Partly controlled asthma: 2-3 of the above criteria from point 1) fulfilled. 3) Uncontrolled asthma: <2 of the above criteria from point 1) fulfilled. The future risk of exacerbations and fixed airflow limitation (see Definition, Etiology, Pathogenesis, above) as well as treatment issues (correct inhaler technique, adherence, adverse effects) should also be assessed. When the treatment level needed for asthma control is established (Figure 1), it is used in the evaluation of the severity of asthma, which may be mild (controlled with step 1 or 2 treatment), moderate (controlled with step 3 treatment), or severe (step 4 or 5 treatment necessary). Differential diagnosis includes chronic obstructive pulmonary disease (COPD) (Table 1 in Chronic Obstructive Pulmonary Disease), vocal cord dysfunction, hyperventilation with panic attacks, heart failure, bronchiectasis, pulmonary embolism, and respiratory tract infections. Less frequent conditions: Tumor of the respiratory tract, foreign body aspiration, tracheal stenosis after tracheostomy, bronchiolitis obliterans, acquired tracheobronchomalacia, hypereosinophilic syndromes. See also other causes of chronic cough and of attacks of dyspnea. Asthma cannot be cured, but with the appropriate treatment it is usually possible to achieve and maintain good asthma control. Education consists of informing the patient about the diagnosis and nature of the disease, available treatments, drug inhalation techniques, measures used to reduce exposure to the factors triggering asthma attacks and exacerbations, and monitoring of disease control. Patients should have a personal written asthma action plan covering controller treatment and measures to be taken in case of exacerbations. 1. Encourage the patient to engage in physical activity (inform about exercise-induced bronchoconstriction and methods of its prevention). 2. Actively help to cease tobacco smoking (counseling, pharmacotherapy). 3. Identify subjects with occupational exposures and provide counseling on the appropriate methods of prevention. 4. Recommend allergen avoidance methods in sensitized patients (in the case of majority of indoor allergens these methods are of unproven effectiveness). 5. Schedule psychological counseling or mental health assessment when necessary. 6. Recommend annual flu vaccination in patients with moderate-to-severe asthma. 1) Controller medications, administered on a regular basis (long-term daily administration), include ICSs, inhaled long-acting beta2-agonists (LABAs), tiotropium, leukotriene modifiers, and sustained-release theophylline. 2) Reliever medications, used as needed, include inhaled rapid-onset beta2-agonists and inhaled anticholinergics. This group also comprises oral corticosteroids and other drugs used for short periods of time to treat asthma exacerbations. 3) Treatments used in severe asthma include oral corticosteroids, anti-IgE monoclonal antibody (omalizumab), and bronchial thermoplasty. The choice of asthma medications depends on the level of asthma control and previous treatment (treatment steps: Figure 1). In patients with infrequent symptoms (≤2 times a month, without night symptoms), normal lung function, and no risk factors for exacerbations, only intermittent treatment with a short-acting beta2-agonist (SABA) as a reliever is suggested (step 1).Evidence 1Weak recommendation (benefits likely outweigh downsides, but the balance is close or uncertain; an alternative course of action may be better for some patients). Low Quality of Evidence (low confidence that we know true effects of the intervention). Quality of Evidence lowered due to fact that despite this being the established pattern of practice, there is no experimental evidence but also no proven better alternative. In previously untreated patients with more frequent symptoms of asthma, it is recommended to start with step 2 treatment (preferably with a low-dose ICSEvidence 2Strong recommendation (benefits clearly outweigh downsides; right action for all or almost all patients). High Quality of Evidence (high confidence that we know true effects of the intervention). O’Byrne PM, Barnes PJ, Rodriguez-Roisin R, et al. Low dose inhaled budesonide and formoterol in mild persistent asthma: the OPTIMA randomized trial. Am J Respir Crit Care Med. 2001 Oct 15;164(8 Pt 1):1392-7. PubMed PMID: 11704584.Busse WW, Pedersen S, Pauwels RA, et al; START Investigators Group. The Inhaled Steroid Treatment As Regular Therapy in Early Asthma (START) study 5-year follow-up: effectiveness of early intervention with budesonide in mild persistent asthma. J Allergy Clin Immunol. 2008 May;121(5):1167-74. doi: 10.1016/j.jaci.2008.02.029. Epub 2008 Apr 11. PubMed PMID: 18405951.; consider step 3 in those with symptoms on most days or night symptoms ≥1 times per week). Controller medications result in clinical improvement within a few days from the beginning of treatment and their full therapeutic effects develop in 3 to 4 months. Frequent use of reliever medications (≥2 times a week) is an indicator of poor asthma control and need for intensification of controller treatment. 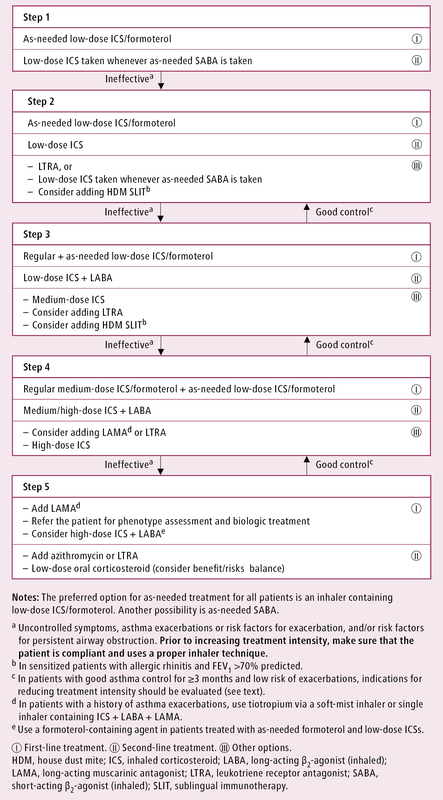 If ICS monotherapy is not providing good control, it is recommended that the preferred next treatment step consists in adding a LABA to a low-dose ICS (step 3).Evidence 3Strong recommendations (benefits clearly outweigh downsides; right action for all or almost all patients). Moderate Quality of Evidence (moderate confidence that we know true effects of the intervention). Quality of Evidence lowered due to imprecision. Chauhan BF, Ducharme FM. Addition to inhaled corticosteroids of long-acting beta2-agonists versus anti-leukotrienes for chronic asthma. Cochrane Database Syst Rev. 2014 Jan 24;1:CD003137. doi: 10.1002/14651858.CD003137.pub5. Review. PubMed PMID: 24459050. If asthma control is still not achieved, it is recommended to step up to a medium-dose or high-dose ICS/LABA (step 4).Evidence 4Strong recommendation (benefits clearly outweigh downsides; right action for all or almost all patients). High Quality of Evidence (high confidence that we know true effects of the intervention). O’Byrne PM, Naya IP, Kallen A, Postma DS, Barnes PJ. Increasing doses of inhaled corticosteroids compared to adding long-acting inhaled beta2-agonists in achieving asthma control. Chest. 2008 Dec;134(6):1192-9. doi:10.1378/chest.08-1018. Epub 2008 Aug 8. PubMed PMID: 18689590. Bateman ED, Boushey HA, Bousquet J, et al; GOAL Investigators Group. Can guideline-defined asthma control be achieved? The Gaining Optimal Asthma ControL study. Am J Respir Crit Care Med. 2004 Oct 15;170(8):836-44. Epub 2004 Jul 15. PubMed PMID: 15256389. Patients who do not achieve asthma control with step 3 treatment need to be reevaluated for other conditions or factors responsible for severe asthma. 1) ICS: Reduce the dose by 50% or to once daily (when a low dose had been used). 2) ICS + a LABA: Reduce the ICS dose by 50% or to once daily (when a low dose had been used) and continue the LABA. LABA discontinuation is more likely to lead to deterioration. 3) ICS + formoterol (as maintenance and reliever treatment): Reduce the ICS dose (by 50% or to a low dose), continue maintenance and as-needed treatment. 4) ICS + a second controller: Reduce the ICS dose by 50% and continue the second controller. 5) High-dose ICS + a LABA + an oral corticosteroid: Reduce the oral corticosteroid dose in a stepwise manner, then administer it every other day. A sputum-guided approach may be used in experienced centers. In patients in whom adequate asthma control could not be achieved with step 3 treatment, reassess the patient for other diseases and causes of refractory asthma. 1) ICSs: ICSs are the most effective and preferred asthma controller medications and should be the first choice for therapy.Evidence 5Strong recommendation (benefits clearly outweigh downsides; right action for all or almost all patients). High Quality of Evidence (high confidence that we know true effects of the intervention). Chauhan BF, Ducharme FM. Anti-leukotriene agents compared to inhaled corticosteroids in the management of recurrent and/or chronic asthma in adults and children. Cochrane Database Syst Rev. 2012 May 16;5:CD002314. doi:10.1002/14651858.CD002314.pub3. Review. PubMed PMID: 22592685; PubMed Central PMCID: PMC4164381. Dosage: Table 2. Local adverse effects include oral candidiasis, hoarseness, and cough due to throat irritation; prevention of adverse effects: mouth rinsing after drug inhalation (use of spacers when administering drugs via a metered-dose inhaler [MDI)]) or use of prodrugs (eg, ciclesonide). Long-term high-dose treatment may cause systemic adverse effects (see Cushing Syndrome). 2) LABAs: Table 2. It is recommended that a regular LABA never be used without concomitant ICS therapy.Evidence 6Strong recommendation against (downsides clearly outweigh benefits; right action for all or almost all patients). High Quality of Evidence (high confidence that we know true effects of the intervention). Nelson HS, Weiss ST, Bleecker ER, Yancey SW, Dorinsky PM; SMART Study Group. The Salmeterol Multicenter Asthma Research Trial: a comparison of usual pharmacotherapy for asthma or usual pharmacotherapy plus salmeterol. Chest. 2006 Jan;129(1):15-26. Erratum in: Chest. 2006 May;129(5):1393. PubMed PMID: 16424409. Cates CJ, Wieland LS, Oleszczuk M, Kew KM. Safety of regular formoterol or salmeterol in adults with asthma: an overview of Cochrane reviews. Cochrane Database Syst Rev. 2014 Feb 6;2:CD010314. doi: 10.1002/14651858.CD010314.pub2. Review. PubMed PMID: 24504983. To prevent the use of a LABA alone, the agents should be prescribed as a fixed combination inhaler containing LABAs and ICSs. The most frequent adverse effects of LABAs include tachycardia, muscle tremor, and hypokalemia. 3) Leukotriene modifiers: Montelukast 10 mg once daily, zafirlukast 20 mg bid. These are less effective than ICSs as monotherapy but have very infrequent adverse effects. 4) Long-acting muscarinic antagonists: Tiotropium soft-mist inhaler 5 microg once daily can be added in patients with a history of exacerbations despite a medium- or high-dose ICS + LABA treatment. 5) Sustained-release theophylline is less effective than inhaled drugs and more frequently causes significant adverse effects. 3. Reliever medications (administered as needed): Rapid-onset short-acting inhaled beta2-agonists (fenoterol, albuterol [INN salbutamol], terbutaline) (Table 2) are used solely for asthma symptom relief or to prevent exercise-induced bronchoconstriction; they cause rapid symptomatic relief. The onset of action is after a few minutes, the peak effect develops after ~15 minutes, and the effect lasts for 4 to 6 hours. A fixed combination of the rapid-onset LABA formoterol with an ICS in one inhaler may be used both as a controller and a reliever medication. 1) Oral corticosteroids: Prednisone, prednisolone, methylprednisolone. Used only for exacerbations and in patients with severe refractory asthma (step 5 treatment) because of serious adverse effects (see Cushing Syndrome). For intensification of long-term controller treatment, usually 20 to 30 mg once daily in the morning is used; then taper off to the lowest dose providing good asthma control (may be as low as 5 mg/d). Long-term treatment with oral corticosteroids warrants prevention of osteoporosis. 2) Omalizumab, a monoclonal anti-IgE antibody, may be used in moderate or severe allergic asthma uncontrolled on step 4 treatment. It has been shown to reduce severe asthma exacerbation risk. Administer 75 to 600 mg subcutaneously (based on the baseline serum IgE level), 1 to 4 injections every 2 to 4 weeks. Evaluate the effectiveness of treatment after 4 to 6 months. 3) Bronchial thermoplasty: Consider this in selected patients with severe refractory asthma. Because long-term effects are unknown, the procedure should be used in clinical trials only. 5. Allergen-specific immunotherapy is effective for the treatment of allergic rhinitis but is not recommended for the treatment of asthma. Patients with severe refractory asthma are at a slight risk of severe fatal anaphylaxis. 1. Management depends on the severity of exacerbation. Assessment and treatment in primary care: Figure 2. 1) Relieve airway obstruction using inhaled rapid-onset beta2-agonists. 2) Relieve hypoxemia using oxygen therapy. 3) Reduce inflammation and prevent recurrent exacerbations by early administration of systemic corticosteroids. 1) Evaluation of the severity of signs and symptoms and response to treatment. 2) Spirometry or PEF (if possible, measure the baseline value before the initiation of treatment, but only if this does not delay therapy; then repeat PEF until an evident response to treatment is achieved). 5) Direct measurement of hemoglobin oxygen saturation in arterial blood (SaO2) (pulse oximetry); blood gases in patients with life-threatening asthma attacks or with SaO2 <90%. Patients at high risk of fatal outcomes of asthma include those who have a history of life-threatening asthma exacerbations requiring mechanical ventilation; patients who were hospitalized or needed urgent medical intervention due to asthma in the preceding year; patients who currently use or have recently discontinued oral corticosteroids; patients who do not currently take ICSs; patients who have required frequent as-needed inhalations of beta2-agonists; and patients who suffer from a psychiatric disorder or have a history of psychosocial problems. 1) Via an MDI with a spacer: 4 to 10 doses of 100 microg every 20 minutes in mild and moderate exacerbations, up to 20 doses within 10 to 20 minutes in severe exacerbations. Later 2 to 6 doses every 3 or 4 hours in mild exacerbations, 6 to 10 doses every 1 to 2 hours in moderate exacerbations. In severe exacerbations more doses may be necessary. 2) Via a nebulizer (preferably oxygen-driven): This is usually not required except if the patient is not responding to commands. Doses of albuterol are 2.5 to 5 mg every 15 to 20 minutes, continuous nebulization 10 mg/h in severe exacerbation. In very exceptional cases of patients in whom inhaled drug administration is impossible, use IV albuterol. Dosage: 4 microg/kg over 10 minutes, then a continuous infusion 0.1 to 0.2 microg/kg/min with continuous heart rate monitoring; alternatively administer 0.5 mg subcutaneously. 2. Oxygen should be administered as soon as possible in all patients with a severe asthma attack via nasal prongs or a mask (see Oxygen Therapy) to achieve SaO2 93% to 95% (partial pressure of oxygen in arterial blood [PaO2] ≥60 mm Hg). 3. Systemic corticosteroids are used in all asthma exacerbations (except for the mildest cases), usually for 5 to 7 days. The first clinical effects are seen after 4 to 6 hours. Oral administration is as effective as the IV route if the patient is able to swallow the tablets and does not vomit (in such cases give an equivalent dose of the IV corticosteroid). It is recommended to start a concomitant ICS as soon as the patient starts to improve. Dosage: oral prednisone, prednisolone, or methylprednisolone 1 mg/kg, up to 50 mg/d for 5 to 7 days, until satisfactory clinical improvement is achieved; IV methylprednisolone, dosage as above; IV hydrocortisone initial dose 100 to 200 mg, then 50 to 100 mg every 6 hours. a) Via an MDI: 4 to 8 doses of 20 microg repeated every 15 to 20 minutes; in severe exacerbation up to 20 doses within 10 to 20 minutes. b) Nebulized: 0.25 to 0.5 mg repeated every 15 to 20 minutes or continuous nebulization (combined with albuterol). 2) IV magnesium sulfate may be used in severe exacerbations if the patient is not responding to frequent administration of inhaled albuterol. Dosage: 1 to 2 g infused over 20 minutes. 3) IV theophylline may be used rarely and only in exceptional cases if the above-mentioned drugs are ineffective. In patients who have not previously received oral theophylline, you may use IV theophylline in the initial dose of 5 mg/kg over 20 minutes, then continue the infusion 0.5 to 0.7 mg/kg/h (monitor blood levels of the drug). 4) Antibiotics should only be used in the case of a bacterial respiratory tract infection. Before discharging the patient from the hospital, make sure he or she has learned the proper inhaler technique and arrange a follow-up visit (usually after 2-7 days). Educate the patient and modify the written asthma action plan when appropriate. Increase the dose of the ICS for 2 to 4 weeks. 1. During pregnancy both deterioration and improvement of asthma control may occur. Poorly controlled asthma and fetal hypoxia are more dangerous than potential adverse drug reactions from asthma medications. Patient education is very important to ensure these medications are not stopped by the pregnant woman. 2. The principles of asthma controller treatment and management of exacerbations in pregnant patients are similar to those used for the general patient population. Preferred medications include ICSs (or oral corticosteroids if necessary, but efforts should be made to avoid these during the first trimester because of an increased risk of cleft palate) and inhaled SABAs (data on the safety of LABAs is limited). 3. Women who were treated with prednisone in doses >7.5 mg/d for >2 weeks before delivery should receive IV hydrocortisone 50 to 100 mg every 6 to 8 hours during delivery. This is a pattern of practice based on a low quality of evidence. 4. Monitor blood glucose levels for 24 hours in the newborn if the mother had received high doses of SABAs during labor and delivery. 5. All asthma medications may be used in breastfeeding women. 1. Prior to surgery, asthma control and pulmonary function should be evaluated. Optimally, the measurements should be performed early enough to allow for a necessary intensification of treatment. 2. Patients undergoing surgical interventions associated with major perioperative stress (except for minor surgery and surgical procedures in local anesthesia) who were treated with systemic corticosteroids in doses ≥20 mg/d of prednisone or equivalent doses of other corticosteroids for ≥2 weeks in the preceding 6 months should receive IV hydrocortisone in the perioperative period (up to 24 hours after surgery) 50 to 100 mg every 8 hours with the first dose administered before surgery. This is a pattern of practice based on a low quality of evidence. 1) Confirm the diagnosis (see Differential Diagnosis, above). 3) Identify and treat comorbidities (rhinosinusitis, allergic bronchopulmonary aspergillosis, gastroesophageal reflux disease, obesity, obstructive sleep apnea syndrome, anxiety/depression). 4) Exclude exposure to tobacco smoke and other factors affecting asthma control and start available avoidance measures when appropriate. Pharmacotherapy: Recommended a high-dose ICS + LABA + additional controller (leukotriene modifier, theophylline, tiotropium) + systemic corticosteroids when necessary, in the lowest effective dose. Other treatment options in individuals with frequent exacerbations may include a trial of omalizumab in allergic patients or bronchial thermoplasty (while both are effective in some patients, high costs may limit their use). Bronchial thermoplasty is not recommended outside clinical trials. 2. Aspirin-induced asthma (AIA) or aspirin-exacerbated respiratory disease (AERD) is a specific type of asthma that occurs in 5% to 10% of adult patients with asthma. AIA usually starts with persistent rhinitis, which leads to sinusitis and eventually to asthma. Nasal polyps and eosinophilia are frequent. Typical features of AIA are asthma attacks frequently associated with rhinorrhea, conjunctival irritation, and flushing of the head and neck developing within several minutes to hours following the ingestion of aspirin (acetylsalicylic acid [ASA]) or other nonsteroidal anti-inflammatory drugs (NSAIDs). Analgesics safe for patients with AIA include acetaminophen (INN paracetamol) (single doses ≤1 g), salicylamide, and celecoxib. Despite avoidance of ASA and other NSAIDs, asthma persists and frequently has a severe course. The sole objective diagnostic method is aspirin challenge, which may only be performed in specialized centers that also provide desensitization. 1) Immunologic: Induced by allergens (IgE-dependent) or low-molecular-weight sensitizers (IgE-independent), most frequently develops insidiously, with variable latency periods. It is usually preceded by a complex of prodromal symptoms (eg, cough, rhinitis, or conjunctivitis). 2) Nonimmunologic: Called reactive airways dysfunction syndrome (RADS), induced by irritants, results from exposure to very high levels of chemical irritants, and develops up to 24 hours after exposure without prodromal symptoms. It is characterized by severe long-standing nonspecific bronchial hyperresponsiveness. Treatment is the same as in nonoccupational asthma. It is necessary to eliminate occupational exposure to the noxious factor. In some patients this leads to alleviation of symptoms and sometimes even to complete remission. 4. Exercise-induced bronchoconstriction: In patients with asthma bronchoconstriction can occur within 5 to 10 minutes after the end of exercise and resolves spontaneously in up to 30 to 45 minutes (it frequently develops in patients with poorly controlled asthma). Diagnosis: An FEV1 decrease ≥10% during an exercise challenge or surrogate challenge (hyperventilation, inhalation of 4.5% sodium chloride or mannitol). Management: A SABA 15 minutes before exercise. In patients using SABAs daily, introduce regular controller treatment: an ICS (+/- a LABA), a leukotriene modifier, or both. An appropriate warm-up before exercise may alleviate the symptoms. Patients exercising in cold weather may consider wearing a mask to warm the inhaled air. 5. Asthma–COPD overlap syndrome (ACOS): ACOS is diagnosed when features of asthma (variability in symptoms/lung function) and COPD (persistent airflow limitation) are present. Treatment: smoking cessation, pulmonary rehabilitation, an ICS + a LABA. a These tests can be repeated during symptoms or in the early morning. b Daily diurnal PEF variability is calculated from twice daily PEF as ([day’s highest - day’s lowest] / mean of day’s highest and lowest) and averaged over 1 week. c For PEF, use the same meter each time, as PEF may vary by up to 20% between different meters. BD reversibility may be lost during severe exacerbations or viral infections. If BD reversibility is not present at initial presentation, the next step depends on the availability of other tests and the urgency of the need for treatment. In a situation of clinical urgency, asthma treatment may be commenced and diagnostic testing arranged within the next few weeks, but other conditions that can mimic asthma (see Asthma) should be considered, and the diagnosis of asthma confirmed as soon as possible. Source: Global Initiative for Asthma. Global Strategy for Asthma Management and Prevention, 2015. Available from: www.ginasthma.org. BD, bronchodilator (short-acting SABA or rapid-acting LABA); FEV1, forced expiratory volume in 1 second; FVC, forced vital capacity; LABA, long-acting beta2-agonist; PEF, peak expiratory flow (highest of 3 readings); SABA, short-acting beta2-agonist. bid, 2 times a day; DPI, dry powder inhaler; ICS, inhaled corticosteroid; INN, International Nonproprietary Name; LABA, long-acting beta2-agonist; MDI, metered-dose inhaler; qid, 4 times a day; SABA, short-acting beta2-agonist; tid, 3 times a day. Figure 1. Controller treatment of asthma in adults. Based on the 2016 Global Initiative for Asthma guidelines (see Additional Information for details). Figure 2. 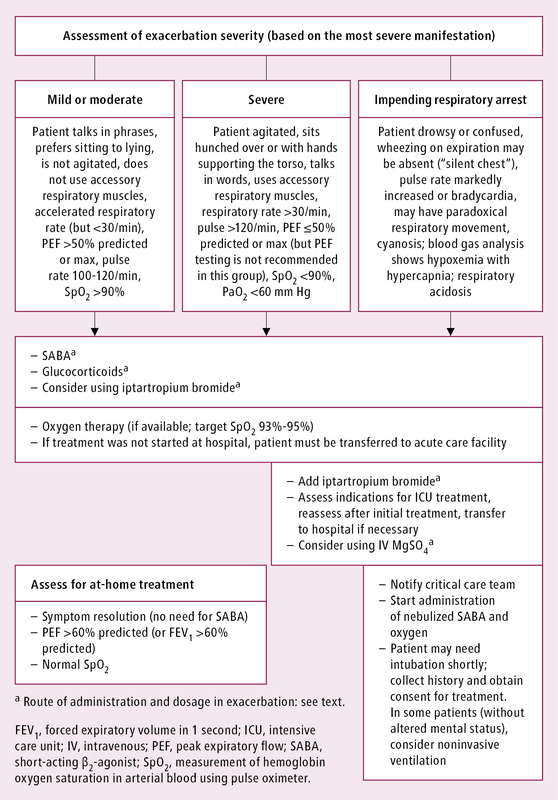 Management of asthma exacerbations depending on severity. Based on the 2016 Global Initiative for Asthma guidelines (see Additional Information for details).